Agnès Varda is one of those directors who have never really stopped working, but who tend to get “rediscovered” every so often after a period of relative obscurity. I’ve seen only a fraction of her complete works, which include many hard-to-access documentaries and shorts as well as features. Still, it’s clear that her recent essayistic documentary The Gleaners And I (2000) picks up several threads she’s followed throughout her career – a concern with traditional crafts and rituals, with the poor and marginalised, and with the everyday minutiae typically excluded from fiction. The official subject of this film is gleaning, the act of gathering remnants of crops from a field after the harvest. As Varda demonstrates, people can be discovered throughout the French countryside gleaning everything from potatoes to grapes, apples to oysters, much as they did hundreds of years ago (though no longer in organised groups). More figuratively, there are also urban gleaners who salvage scraps from bins, appliances from the side of the road, or vegetables from stalls after the markets have closed. And then there’s Varda herself, a gleaner of images, driving around France with a digital camera and a tiny crew (at times, she wields a smaller camera herself, permitting an even greater degree of intimacy). Varda has a (sometimes contested) reputation as a feminist, left-wing artist, and this is very much a political film, though it offers a series of poetic metaphors and concrete encounters in lieu of an explicit, closely reasoned argument. My guess (based mainly on anecdotal evidence) is that the political outlook of The Gleaners And I has a lot to do with its popular success – even if Varda herself, who began filming back in 1999, wasn’t fully aware how thoroughly she was tapping into the zeitgeist. Without specifically referring to political movements or events, the film embodies a quasi-anarchist ethos now in the air in all sorts of ways – a resistance to consumerism, a suspicion of authority, and a desire to reconnect politics with everyday life. One major way Varda expands the parameters of her subject is by making constant reference to paintings and other artworks, both as illustrations of gleaning’s historic past (paintings by Millet and Van Gogh) and as creative examples of gleaning in the present (sculptures, collages and so on made from found materials). Nor is this latter kind of creation restricted to officially accredited artists, as Varda demonstrates through an interview with a man who builds “totem towers” from discarded dolls (“Dolls are my system,” he explains). In general, one of the film’s most appealing features is its democratic treatment of its interview subjects, who range from gypsies and unemployed young people to a magistrate and a psychotherapist: they’re all respected equally, and Varda lets them speak for themselves without passing judgement. It’s odd to see The Gleaners And I finally on general release in Australia as a “new” film, a full two years after its completion. As well as certain obvious shifts in the global political climate, the intervening period has seen a major change in the status of digital video, which has become the default choice of many low-budget filmmakers (especially in documentary). 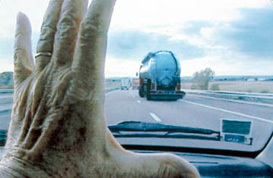 Back in 1999, the use of DV was possibly novel enough to seem like a democratic gesture in itself, a way of reducing the distance between Varda and the people she films – not only because video technology is less cumbersome and intimidating, but because the drabness of video tends to demystify the relationship between the filmmaker and his or her raw material. Compared with film, video images are less likely to be perceived as autonomously beautiful in their own right; instead, they often function in a purely kinetic way, as encoded traces of the primary act of camera operation. (This is true of most Dogma movies, and also – intriguingly – the work of the Dardenne brothers, who transfer the strategy from video back to film proper.) Video thus fits well with Varda’s explicit concentration on the process of gathering images, and on gleaning as a way of operating within the world rather than transforming it as a whole. Not that The Gleaners And I wholly lacks visual beauty. Its most lyrical shots virtually negate the difference between grasping an object with one’s hands and approaching it with the camera, as Varda (or her videographer) pushes up close to a painting, a rain-spattered windscreen, a knobbly potato or human skin. Such moments have the tactile quality of what Laura Marks calls “haptic” imagery (1) – using the camera as a probing instrument rather than the screen as a canvas, dwelling on surface textures rather than offering a totalising three-dimensional perspective. The film’s craft, however, is most visible in its editing, weaving a dense and variegated web of connections with little apparent strain. As a film essayist Varda isn’t as brilliantly witty as Chris Marker, but she has a similarly disarming approach – light and whimsical, yet informed by a scrupulous moral and political intelligence. At times, she can seem to succumb to the temptation common to many “diary” filmmakers of making the recording process an end in itself, bestowing a blanket (in)significance on all possible objects by quizzically insisting that one image can be no more valid than another. It says a lot for Varda’s poise that she can get away with this kind of gesture without being suspected of self-indulgence or insensitivity. It’s only afterwards we might wonder about the gulf between these different types of “gleaning” – ranging from the desperate hunt for food to the playful juxtaposition of images. Varda may be a critically neglected filmmaker, and her work may be economically marginal in relation to the global entertainment industry. But does that give her the right to compare herself to those who are literally starving and homeless? The answer, perhaps, is that we’ve missed the point if we consider creative achievement and practical survival to be entirely separate. Less fancifully than at first appears, Varda’s notion of herself as a “gleaner” suggests the real continuity between superficially different forms of human resourcefulness – both those hailed as art, and those rarely hailed at all.